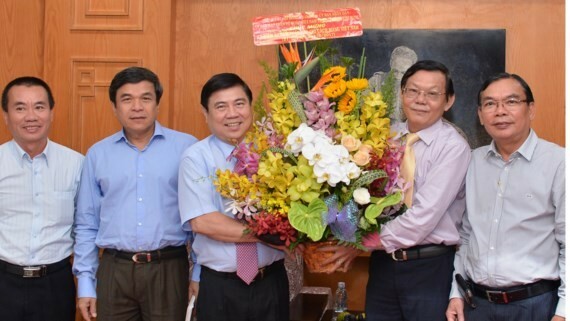 In his visit to Sai Gon Giai Phong newspaper on June 16, Chairman of People’s Committee in Ho Chi Minh City Nguyen Thanh Phong lauds the newspaper for well orienting public opinion for years. The Chairman visited the newspaper’s head office in Ho Chi Minh City and congratulated the newspaper leaders ahead of the Vietnam Revolutionary Journalism’s Day (June 21). 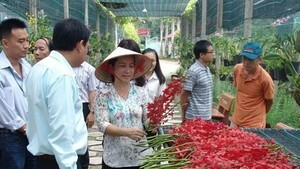 Chairman Phong praised the newspaper saying that it has important role in orienting and leading public opinion rightly. For years, the newspaper has finished its role well; this is a big efforts of the staffs in order to spread the city’s policies to residents, said Mr. Phong. He expected that in next time, the newspaper will continue performing well its role to have articles of the city’s development as the country’s cultural, economic hub. In his part, newspaper Editor-in-Chief Nguyen Tan Phong said that the newspaper has received much attention of Party Committee, People’s Committee, and related agencies, staffs have also made giant efforts to spreading and orienting information of the city to locals in a bid to finish its task. The Editor-in-Chief continued that the newspaper has upgraded its infrastructure of online newspaper to meet readers’ increased demand amongst fierce competitiveness.